"...Even though MISSED OPPORTUNITIES isn't your standard romcom, for this writer, it still leaves a very satisfactory ending. Even though we see the aftermath after a life-changing kiss, it offers more character depth and brings a more realistic ending to this modern day romantic tale. 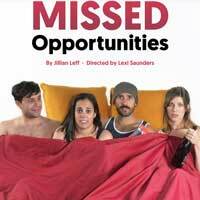 MISSED OPPORTUNITIES might not be the best fit if you're not looking for a romcom theatre night. But it would be a good pick for a date night or if you're interested in a millennial love story."